Mesut Ozil (£9.4m) claimed Arsenal’s winning goal and the maximum Fantasy Premier League bonus points in Monday's 2-1 victory at Middlesbrough. Ozil scored his seventh of the season to earn 34 in the Bonus Points System (BPS), also completing 83% of 46 attempted passes and winning two tackles. Middlesbrough’s goalscorer, Alvaro Negredo (£6.2m), picked up two additional points with a score of 30 in the BPS. He has 15 bonus points for the campaign, two more than any other team-mate. Having earned the assist for the visitors’ opener, Granit Xhaka (£5.2m) collected the final bonus point with a BPS score of 27. The midfielder won two tackles and completed 90% of his 93 passes – more than any other player at the Riverside Stadium. Alexis Sanchez (£11.6m) missed out on bonus points despite scoring Arsenal’s opening goal from a free-kick. He committed three fouls and was tackled on seven occasions to end with 20 in the BPS. Negredo topped the ICT Index ratings, earning 12.0 – his highest tally of the season. A Threat score of 87 was the key factor, thanks to four shots on goal, three from within the Arsenal penalty area. Sanchez ranked second in the Index, returning his best score (11.1) since Gameweek 25. He enjoyed more touches in the opposition box than any other player in the match, but mustered only two shots on goal and created a single chance. With Middlesbrough set to play both AFC Bournemouth and Sunderland in Gameweek 34, interest in Negredo is on the rise. More than 24,000 FPL managers have acquired the striker since the weekend deadline after he scored a second goal in five appearances under Steve Agnew. Only Manchester City’s Sergio Aguero (£12.8m) has fired more shots inside the penalty area (20 to 16) than Negredo since Gameweek 29. At the back, Agnew will need to assess the fitness of Victor Valdes (£4.6m), who missed last night’s fixture through injury. Owned by 6% of FPL managers, Valdes is second only to Manchester United’s David De Gea (£5.4m) for transfers in among FPL goalkeepers ahead of his Double Gameweek 34. 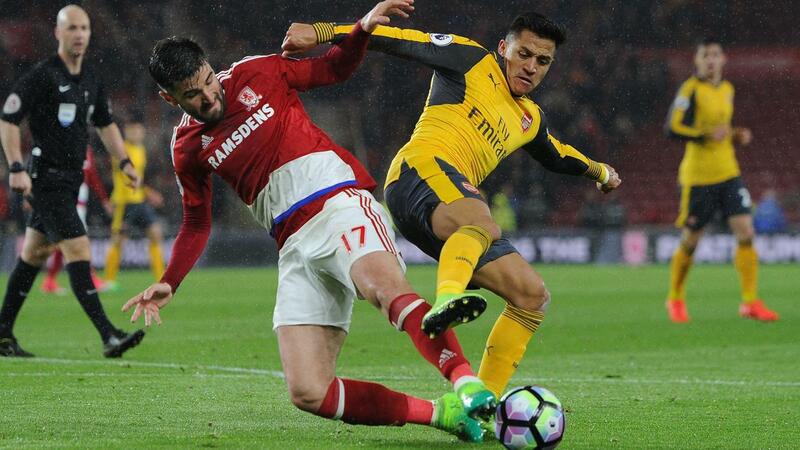 For Arsenal, Sanchez returned to the scoresheet for the first time in four Gameweek appearances and was handed a central-support role behind lone striker Olivier Giroud (£8.1m). The Chilean’s sublime free-kick helped him climb back to the top of the FPL player standings on 210 points, ahead of Everton's Romelu Lukaku. Ozil, meanwhile, has supplied two goals and a pair of assists in his previous four outings. With seven fixtures still to play, including Double Gameweeks 36 and 37, he could also be set for a prominent role in our plans over the run-in as a cheaper midfield alternative to Sanchez.